I think that thought alone is the main reason I became a teacher. But it is also the reason I worked on what I called “the Making Algebra Meaningful Project” (Surprisingly not an oxymoron! But it took me a long time to come to that conclusion…). And it was why I started looking at teaching and learning with technology, became a technology integrator, and later a partner in the first statewide learning with laptop initiative. And it was why I did my graduate research on motivating underachievers. Keep in mind that when I started teaching, I didn’t really know how to teach any way other than “how it was done to me,” but it was my motivation to explore how to reach more learners. For about five years, I had the opportunity to work with a great group that focused on creating schools designed to motivate students (well, still focuses, I just work in Auburn now). 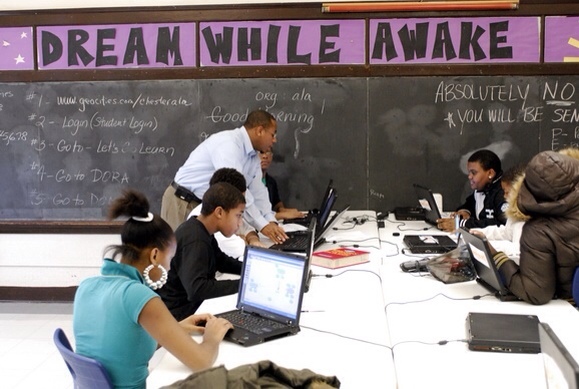 Among other projects, we helped the School District of Philadelphia write and support a Magnet School grant, and we created a successful nontraditional school that combines online curriculum with project-based learning and graduated students at a high rate. And they helped me create Projects4ME, the statewide virtual project-based program for at-risk and dropout youth in Maine, that got me connected to Auburn in the first place. We were/are big believers in multiple pathways to graduation, and that educators will only be successful raising graduation rates and decreasing dropout rates when districts offer students several different approaches to learning, so they can choose the one that works for them. We were trying to make those Mexican food schools. Now I’m in Auburn, where we’re working hard not just to make Mexican food schools for students, but Mexican food programs inside of schools, and lots of other “flavors,” as well. What are you doing to make sure your students’ diverse tastes in how they learn well are being addressed? This entry was posted in Customized Learning, Food For Thought, Motivation and tagged Helping Students Succeed, Learning Theory, Multiple Pathways on May 26, 2012 by Mike Muir.